1) Heat the olive oil in a heavy-based saucepan. Add the garlic, onion and ginger, then sweat on a medium heat until the onions are soft and translucent, around five to eight minutes. 2) Add the mustard powder, turmeric powder, coriander powder and Madras curry powder, stir into the onion mix and fry for a further two to three minutes, stirring constantly, until fragrant. 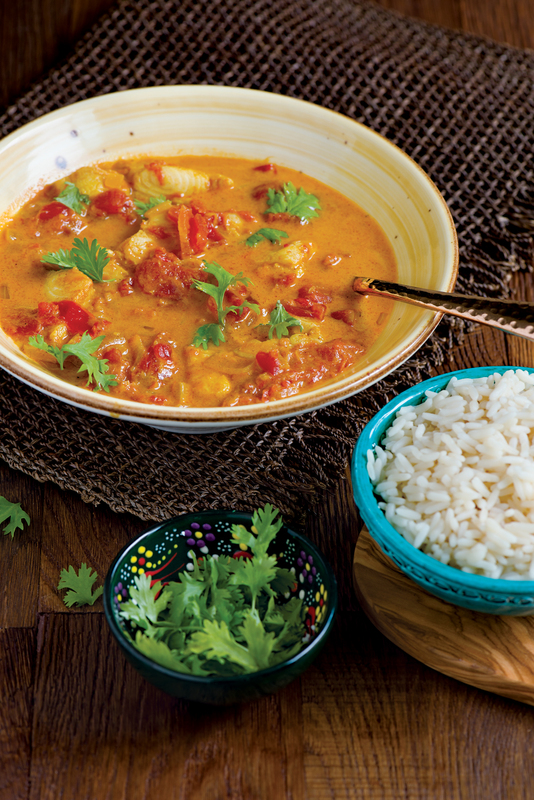 3) Add the chopped tomatoes and coconut milk, bring to the boil, reduce the heat and simmer for five minutes. 4) Add the fish chunks to the pot and cook for eight to ten minutes, until the fish is cooked through. 5) Serve hot, alongside some steamed rice.